Nokia brings art to new levels of experimentation through the mobile phone with the “ARTESTO” exhibition that will be held from 22 February to 19 March 2006 at the Triennale, under the patronage of the Municipality of Milan. “ARTESTO” is the first exhibition of Mobile Art in Italy, art created expressly for mobile phones. Conceived and curated by Lorella Scacco and Marianne Viglione, it is the result of a creative collaboration between intellectuals, poets, writers, musicians and visual artists, and it is a further step of Nokia’s “Connect to Art” initiative. The “Connect to Art” project started in 2004 from the idea of placing “art in the palm of a hand” and transform the mobile telephone into an experimentation tool for artists. Nokia becomes client of artworks promoting art to the audience through mobile phones. The idea for “ARTESTO” originated from the identification of some key messages, motions and states of the mind around issues of sensitivity, passion and transparency. Philippe Daverio, Erri De Luca, Carlo Freccero, Alda Merini, Mogol and the Subsonica music band are the experts invited to identify and create some key messages. The exhibition will contain works by Italian artists Bianco-Valente, Botto & Bruno, Globalgroove, Antonio Rovaldi, Studio Azzurro, and ZimmerFrei – who have created the visual pieces linked to the messages – as well as a selection from previous international projects (Finnish Kati Åberg, Juha Hemànus, Stefan Lindfors, Osmo Rauhala, Louise Bourgeois, David Salle, William Wegman, Nam June Paik and Brian Alfred). An artext is a combination of words and images transmitted through a mobile phone screen. 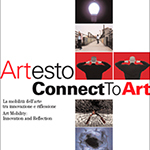 ARTESTO will be documented in a book to be published by Skirà, with texts by project/exhibition curators Lorella Scacco and Marianne Viglione and contributions by Eero Miettinen, Director of Nokia Design, Alessandro Lamanna, CEO of Nokia Italia, and Juha Hemànus, Nokia Senior Designer. “Art enters the contemporary communication sphere while, at the same time, the mobile phone becomes an alternative channel to spread art“ declare Lorella Scacco and Marianne Viglione, who are the creators and curators of the project. “The artext, conveyed through mobile telephones, is a way of expressing the moods of each of us through a work of art. In this way, art enters the contemporary communication sphere in order to try and make it increasingly receptive and responsible towards actual public demands”. The site www.nokia.com/art starting from 22 February will contain artworks by Bianco-Valente, Botto & Bruno, Globalgroove, Antonio Rovaldi, Studio Azzurro, ZimmerFrei that will be downloadable to the mobile phone free of charge.